You must be a business owner to qualify to win. 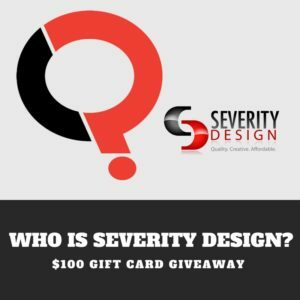 You must “like” Severity Design’s Business Page on Facebook. You must “share” the contest post on Facebook with your network. You must refer 3 of your friends in the comments by tagging them or sharing with them this promotion. You must fill out the contest entry form below completely. The contest runs until Friday, April 6th 2018, at which time we will select the contest winner by drawing during a Facebook LIVE broadcast. You do not have to be present on the Facebook live contest to win and winners will be notified by communication either by email or phone.